Summer is just around the corner, and if you’re like many moms, you may be wondering how to get the kids off of technology and into a book once in awhile, right? This is my how-to guide for summer reading for teens. Reading is an important skill for success – no matter how you define it – and of course we all want our children to succeed. With that in mind, let me share six ways that you can encourage your teen (or pre-teen!) to get into a book and get off of the X-box. Purchase a (aff) Student Prime account from Amazon. You can get them their own account at half-price, allowing them to download books to their heart’s content. I recommend, however, that you sit down with them beforehand and decide on ground rules. Will there be a $$ limit? Some genres that are “no-go”? Will they need your approval, or at least review, before they make a purchase? You know your children best, so make your rules and expectations meet their needs and abilities and your family’s values. Check into the free 30-day trial that (aff) Audible offers and get two free audiobooks! Does your child like to go around listening to music through those headphones? Maybe audiobooks is the route to go. No, it’s not exactly reading per se, but it is a great way to expose them to good literature. There are hundreds, if not thousands, of titles available, and more added all the time! Host a teen Reading Contest! Get together with some moms and put together a great prize package for the winner! 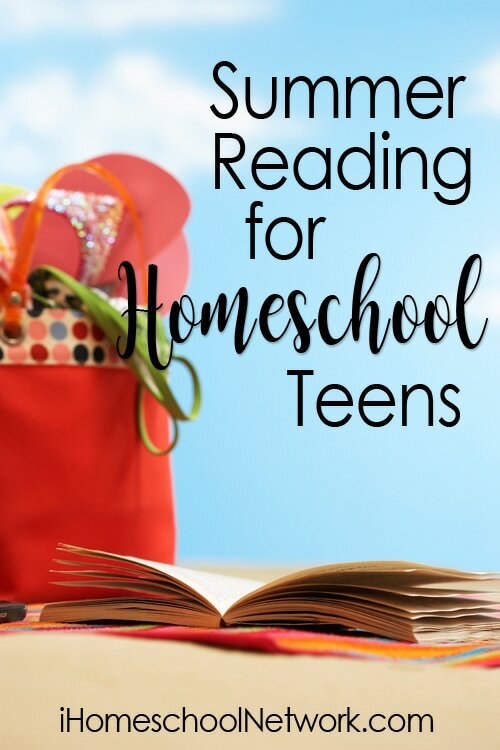 Or approach your local library to see if they’re doing anything for teens… Or suggest that your local homeschool support group put one together. If that’s the case, however, make sure you’re willing to volunteer to head it up. And I’ll bet you could find another book-lovin’ mama to co-lead it with you! Model reading. OK, mom (and dad) time for you to pick up a book, too! Why not have a family reading contest? Sure, dad may be busy, but you could give him a pass and let him count the audio books he listens to on his commute to and from work. A contest may inspire a bit of friendly competition, and periodic discussions are another “excuse” to get the family together despite everybody’s crazy schedules. If your family doesn’t relish the competitive aspect, you could just have everybody keep a log, and then record the pages read together as a family. So there you have it: both techie and non-tech ways to encourage your teen to get into the activity of reading. Hopefully, this will be the summer that reading becomes a habit! This will be the summer they develop a love for books! You know, there are oh-so-many demands on your teen’s attention these days.